Normally I don’t delve into religion on this blog, except in relation to the first amendment. In the vein of informal posts, this one’s about religious philosophy. It was sparked by a an avid atheist guest to a program I listen to. As I listened to Christopher Hitchens in the interview, I was surprised, and though it took me some time to formalize it, I know precisely why. He’s a religious zealot. I know, that sounds crazy because he’s the author of “God Is Not Great: How Religion Poisons Everything.” Normally I listen to an atheist’s opinion, respectfully disagree because of my personal experiences and the positive influence of religion in my life, and move on. This guy’s tone, however, was really familiar. I’d heard it before, as a missionary preaching in (of all places) New York City. He sounded just like any hard-headed religionist arguing against another, something I found never to work as a missionary (I’ve always been one of those, “If you’re interested, I’ll share,” types, not the “swallow this or burn in hell” sort). It wasn’t just Mr. Hitchens’ tone, though. It was his unwavering faith. Atheism isn't based on empirical data. Logic tells us that in the absence of empirical evidence, you can’t prove a negative. Thus I can prove, “There is no elephant in my pocket,” but I can’t prove “God doesn’t exist.” A cogent discussion of this topic may be found here. An individual may be personally satisfied through inductive reasoning that he or she doesn't think God exists. “I've seen no evidence God exists, so I don't think he/she/it does” is a logical, reasonable statement, but “God absolutely does not exist” is a statement of faith, and Mr. Hitchens was vehement in his faith-based position. He and I do agree on one thing–you should absolutely believe in what makes you happy. He doesn’t seem to live by his own standard, though. He’s an adamant evangelist for atheism, seeking to tear down other belief systems, and atheism is undeniably an organized religion with councils and societies designed to propagate and strengthen their faith. Recently, they’ve designated a symbol for the gravestones of fallen solders. Why not a blank space where the symbol should go if one is an atheist? It has been my observation that one's comfort in one's faith may often be determined by one's comfort with the beliefs of others. Mr. Hitchens' need to attack and break down other people's belief systems would indicate unsure footing with regard to his own. I have a close friend who has become atheist and we have no such issues. Both of us are quite secure in our respective belief systems. That's because I don’t have a problem with atheism. I recognize my own faith isn’t logical, or logically provable. I simply ask that there be no pretense that atheism is rationally founded. Agnosticism, a simple, “I don’t know, and see no proof of God” is logical and empirical. So, given our adamant separation of Church and State, one simply can not establish Atheism as the official U.S. religion, nor seek to do so, giving it any government-sponsored advantage over any other religion. Note that I don’t want my religion to be the State religion either, I simply want Atheists to cease pretending what they believe is not religious in nature and seeking to have their rights protected above the rights of others. I understand Mr. Hitchens feels that Christians, Muslims and others are trying to push their religions at the expense of his rights, and I’ll fight against a theocracy by his side should any group seem to be succeeding. I’ll counter Shari’a law as readily as a Biblical Theocracy or an Atheistic rule. When it becomes law, religion loses meaning. There is no faith in the absence of freedom to believe differently from my neighbor, or leave my religion and seek another or become agnostic. Only those weak in their own faiths seek to force others by law, argument, the sword or other means to convert to their way of thinking. In Christians it’s singularly distasteful given that Christ taught by invitation and example, never by force or coercion. It is my believe that any faith, sincerely and peacefully held, strengthens all faith. I had a great comment by a thoughtful reader who pointed out I haven't been rigorous in defining atheism and agnosticism. I was directed to this link for clarification. That's a very good point. I should be clear that I wasn't terribly rigorous in writing this, but also that I was specifically responding to comments by evangelical atheists, who are beyond the idea of "I don't believe God exists," and on to, "God does not exist and your belief in one offends me." For clarification of terms beyond casual use, the above-linked article is worth a read. Victor Davis Hanson published a fantastic column at the National Review Online. He titled it "Obama and the New Civility," and it essentially points out the hypocrisy of the Democrat party and the need for equal treatment of all points of view by the media. It's linked above, but more explicitly, you can find it here. You may have heard this audio. It's Rep. Dingell telling the truth. He says he misspoke due to fatigue. "The harsh fact of the matter is, when you're going to pass legislation that will cover three hundred American people in different ways, it takes a long time to do the necessary administrative steps that have to be taken to put he legislation together to control the people." I think he meant "three hundred million American people." Why in different ways, Rep. Dingle? Aren't we all equal? If you're going to have the government provide our care, shouldn't it be as good as what you get? Oh, wait. No country on earth could afford to provide the "Cadillac" health care plans Congress gets for all its citizens. While this legislation doesn't quite move us to socialized medicine, it's designed to put private insurers out of business so there will be no choice. Once we're reliant on government for our care, Rep. Dingell and every authoritarian government enthusiast will realize the dream of exerting more control over the people. Are Taxes too High? Only if you're paying them. About half of Americans don't pay any Federal Taxes (that is, all their tax money paid in during the year is returned to them, sometimes with extra on top). About half of Americans feel taxes are too high. It seems likely there's an obvious correlation there. If you pay taxes, you feel they're too high. If you don't, you feel they're fine. That's a situation that will eventually sink a republic as those who take begin to outnumber those who pay. As addressed in previous posts, we need a simpler system, the fair tax or the flat tax. Everybody must participate and have an interest in the system, or the system will fail. Bryan Suits is a talk show host who does a weekend show for KFI radio of Los Angeles on the military and military issues around the world. This week, he had a few thoughts on Kyrgyzstan. I've transcribed leaving out extraneous verbal revision. Quickly, Kyrgyzstan, a revolution. The government came to power after the Tulip Revolution from 5 years ago and they were increasingly thuggish, and they were kind of amateurish when they were renegotiating the lease for the Manas air base North of the capital that the U.S. Air Force, the U.S. Military uses. [It's a] very crucial hub. Everything that goes into Afghanistan, every person, every human being that flies in or out of Afghanistan flies through that air base. Sometimes they go and hang out. They fly in for a couple days. It's the Afghanistan equivalent of Kuwait. The Kyrgyz government knows it's crucial, the Russians know it's crucial as well. I believe it's the only country on Earth where there is an active U.S. military base and an active Russian military base. The Russians want it to be one or the other and they don't really like our base there, but we pay cash and the Kyrgyz need cash and they were keeping the cash. There's a long list of problems that the Kyrgese people had with this particular government right now, but the protest last week...began as robust protests. The final straw apparently was last weekend when the Kyrgyz government raised utility rates on everybody. Now this is a country that could be the Saudi Arabia of hydroelectric power, but they are dragging their feet on bringing electricity to their people. They're enriching themselves buying Beamers and Mercedes and everything. They're cash rich. And we're not a lot of help. We don't hold their feet to the fire about liberalizing their country. So the people take to the streets last week. In the span of a couple hours the protest got serious because police started firing live rounds back at people. In another city, a crowd of demonstrators broke into a government building and beat the Interior Minister to death. So you know that things aren't going to go well that day for either the government or the demonstrators. The president of Kyrgyzstan, who disappeared, who is down with his ethnicity in Southern Kyrgystan, apparently he personally ordered his police to get up on the roof tops of the capital building of the government headquarters in Bishkek,the capital. Their strategy was not to snipe the demonstration leaders. He didn't say, "Shoot at the guys with the megaphones, shoot at the guys leading the crowds." He said, "Shoot at random people in the crowd, that way you'll terrify everyone into going home." Well, here's something he forgot. Gun ownership is legal in Kyrgyzstan. People went to gun stores in Bishkek and they either paid cash or looted the guns. They came back to the government square and when the police were firing using live rounds at them, they started firing back. And the police retreated. Hours later, the dust settled and they're in charge [the demonstrators]. They called a former foreign minister and said, "How would you like to be president until further notice?" She said, "Hey, why not?" Mr. Suits focuses on military action around the world, and went on to say that flights were being diverted during the upheaval, but this morning they appear to have resumed. My point is that the 2nd Amendment is as relevant as ever, and effective as ever at stopping would-be tyrants. No such rebellion is necessary in the U.S., but those who say personal firearms are irrelevant in this sort of situation are simply wrong. Case study after case study confirms it. The rest of the audio is available from KFI. You'll be looking for the 04/11/2010 podcast of Bryan Suits' Dark Secret Place. I was just sent a shocking link. Some time ago, I wrote about how if we accept media premise of a link between number of guns and death or crime, it's clearly better for society to have more guns. By the way, I do think that's true. You can not stop criminals from getting guns, you can only have lawful owners so outnumber them that they're scared to even think of drawing theirs because they'll be shot by people who actually go to the range, clean their weapons and can hit something smaller than the front of a house. The main stream media, despite honest statistics and anecdotes, still pretends guns themselves, not criminals, are the problem, though. So, when I got this Newsbuster's link, I was as surprised as Noel Sheppard to see MSNBC would publish this. Not that they don't try to make the case that it might not be private firearms making society safer, but whether it's lawful owners or some related statistical confounding factor, the fact is that there is a correlation between increased private firearms ownership and reduced numbers of firearms deaths. Common sense will tell you that (a) if more people are properly trained and familiar with guns and what they can and can not do, and (b) criminals know they may be shot if they try to harm innocent people, there are going to be fewer incidents of gun deaths. MSNBC also started with an incident of armed citizen self defense like I reprint weekly (eventually monthly when I run out of back issues of American Rifleman). My response? Good for you, Mr. Corley. Also, as any carry enthusiast will tell you, the best gun is the one that's light enough for you to carry all the time, as you never know when trouble will find you. My response? Mourn what? Helms' indefensible, irresponsible and inexcusable decision to put innocent people at risk by waving a gun around, put those people in fear of their lives and attempt to rob them? Now, the taking of human life is always regrettable, even tragic, but Helms is at fault, and no one else bears any responsibility for the outcome of his actions. In fact, perhaps Mr. Corley should be able to sue the family for producing such an awful human being. Such suit would make as much sense as trying to blame Corley for defending himself. Further, good for South Carolina. 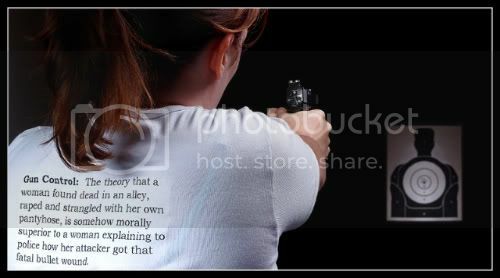 I'd love it if every state prohibited criminals and their families from suing victims when the victim has the "temerity" to defend himself or herself instead of complacently getting robbed, raped or murdered and waiting for police to sort out the evidence and maybe catch the attacker. South Carolina just moved up my list of places to move when I eventually get out of California. To the media's shock, it would appear the founders really were trying to make society safer with the 2nd amendment. Some of us aren't surprised. I heard a bit of an interview with James Lovelock, creator of the Gaia theory and a driving force behind the anthropogenic theory of global warming. I couldn't believe what I'd heard. While I don't agree with his conclusions or outlook on climate change, he gives some startling information in this interview, notably at 1 minutes and 57 seconds: "It hasn't warmed any time during this century, and we're having one of the colder winters than we've had for a long time this year. Not just here, but in all of Northern hemisphere..." I've set it to begin at the second of several clips, as the beginning isn't relevant in my opinion (and I don't agree with his opinion, though you're free to listen if you like). According to the YouTube clip, this aired on 03/30/2010 on Radio Four on the BBC. Do listen to what he says about scientists fudging data. You'd think if people figured this out over 150 years ago, we'd still be aware of it.